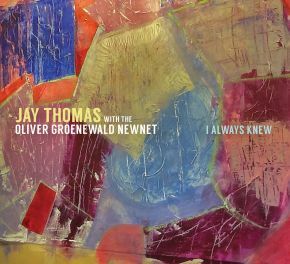 Having always found inspiration in the evocative recordings of Gil Evans and Miles Davis, and from the great balladeers - Dexter, Trane, Turrentine, Clifford Brown - veteran Seattle trumpeter/saxophonist Jay Thomas was always on the lookout for the right relationship with an arranger who could properly frame his vision for a recording of richly orchestrated ballads. Meeting the German composer/arranger/trumpeter Oliver Groenewald opened the door to several years of collaboration, culminating in this inspired collection of ten rarely-heard jazz classics and originals, and closing with the time-honored hits, "You Don’t Know What Love Is" and "Stardust." Performed with the intention, clarity and sustained energy of a master melodist, "I Always Knew" was recorded in one room, with no separation, no headphones, and no overdubs, channeling the works of Thomas' musical mentors while further establishing his own position in the pantheon of essential jazz voices.